There's even more to be told of the antics of the SOS Brigade—under Haruhi's leadership the possibilities for fun and mayhem are endless! Join your favorite characters in this huge collection of brand-new adventures and illustrations from a wide range of artists and storytellers! Jam-packed with more time travelers, aliens, espers, and Haruhi than Kyon can handle, this anthology is the perfect addition to any collection! See more info for details. 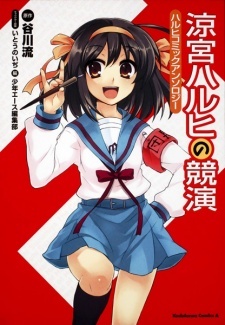 Haruhi Comics Anthology was published both physically & digitally as a 3-in-1 omnibus in English as The Celebration Of Haruhi Suzumiya by Yen Press on October 28, 2014.